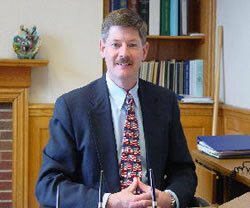 Welcome to the Maine Criminal Justice Academy’s (MCJA) website. Our goal is to provide you with the latest information regarding upcoming classes, Board of Trustees information, Academy forms, as well as a brief history of where the Academy has been and where we intend to go. As the Director, I view my mission as fourfold. First, is the Basic Law Enforcement Training Program (BLETP). My staff and the Board of Trustees constantly evaluate everything in this 18-week program, from the academics to the interaction between the Cadets and staff. Our goal is to educate the Cadet to understand the basic tenets of being a modern law enforcement officer. Cadets will learn the importance of chain of command, lifetime fitness and being physically fit, report writing, understanding the principles of community policing, effective communications, the ability to problem-solve and “think on their feet” and finally, all with strong ethical oversight standards. Second, is the Basic Corrections Training Program (BCTP). My staff and the Board of Trustees redesigned the program from the module-based program to the current 5-week, 200 hour, Basic Corrections Training Program. Our goal is to provide our students with state of the art curriculum to address the many changes that correctional facilities are facing today, and better prepare them to maintain the safety and security of inmates in their charge. Third, is the in-service training. Supervision and management training programs for law enforcement and correctional officers are offered, such as: Supervisor Development, Executive Development and New Chiefs/Sheriffs Seminar. The Academy also offers investigative courses in Intelligence Gathering, Interview and Interrogation, Police Photography, Evidence Collection, and Drafting Effective Search Warrants. Additionally, the Academy provides the Law Enforcement Pre-service (LEPS) course, which includes a 40-hour online Phase 1 component, an 80-hour classroom Phase 2 component and an 80-hour of field supervision Phase 3 component. Fourth, I see the mission of the Director to bring these training courses to all law enforcement and corrections officers, as well as other participants in the criminal justice system both at the Academy and regionally. We offer mandatory in-service courses on-line through a partnership with Justice Planning and Management Associates (JPMA) http://www.jpmaweb.com I also spend time dealing with legislative issues as they pertain to the Academy, working with the MCJA Board on license and decertification issues, and finally being open and available to the criminal justice community, to make the necessary changes that will enhance law enforcement and correctional training.